NASA Hubble's Camera - Universe Galaxies And Stars Section. NASA working on solution for Hubble's space telescope camera. NASA Working on Solution for Hubble's Camera. Image credit: NASA. 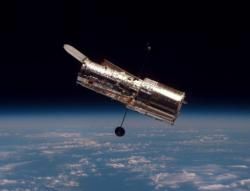 NASA officials announced today that the malfunctioning main camera for the Hubble Space Telescope should be back online by July 3. Ground controllers first learned of a problem with the Advanced Camera for Surveys on June 19, when a voltage spike caused the camera to shut down. Officials think a bad transistor might be responsible for the voltage problem, and believe they can resolve the problem without any degradation to Hubble's performance. Hubble Space Telescope. NASA engineers continue to examine the issues surrounding a problem related to the Advanced Camera for Surveys aboard the agency's Hubble Space Telescope. Engineers received indications on Monday, June 19, that the power supply voltages were out of acceptable limits, causing the camera to stop functioning. The camera has been taken off line so engineers can study the problem and determine the appropriate remedy. Hubble observations are continuing using the other science instruments on board. The board will meet at Goddard Thursday, June 29, to decide the best course of action. Engineers anticipate instrument observations will resume no earlier than July 3, with no degradation to performance.